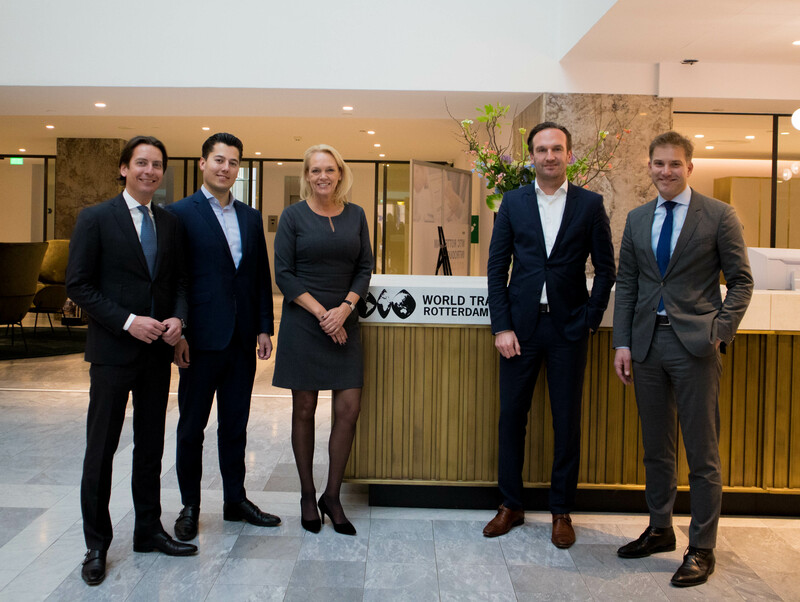 From left to right: Mark van den Heuvel (De Mik Bedrijfshuisvesting), Martijn Dijkstra (JLL), Eveline Steenbergen (Managing Director WTC Rotterdam), Rolf Oostendorp (CEO Interparking) and Jan-Willem Kos (Bouwinvest). Photo: WTC Rotterdam. Interparking’s vision of sustainability in the future seamlessly fits that of WTC Rotterdam. Interparking Nederland has been completely CO2 neutral since 2013 and is keeping pace with the growth in energy efficient vehicles by supplying charging points for electric cars and giving a discount to environmentally friendly cars through its Eco Parking scheme. Sustainability was one of the reasons that Interparking chose WTC Rotterdam which is currently being renovated and made future proof. On behalf of the owner, the real estate agent JLL was responsible for arranging the rental. De Mik Bedrijfshuisvesting represented the interests of Interparking. WTC Rotterdam’s master plan, that includes a major renovation and increased sustainability, is bearing fruit. After the entirely renovated Business Center opened in November 2018 with a good 180 new tenants, many large office spaces are ready for occupancy. This also includes the 1,000 m² office space in the high-rise into which Interparking will move in May. Interparking is Europe’s pioneer in parking. Since its founding in 1956, it has grown into one of Europe’s most successful operators of public parking facilities. The Interparking Group, which is part of AG Real Estate and Canadian Pension Plan Investment Board (CPPIB), manages a good 811 car parking garages in nine countries in Europe. Its facilities are used by more than 110 million drivers. Interparking operates two garages in Rotterdam, one next to the Markthal and one on the Lijnbaan. It also manages seven other garages in the city. Interparking strives for high quality parking facilities. Its 187 European Standard Parking Awards (ESPA) testify to the quality of its products and services. The World Trade Center Rotterdam, in the bustling Rotterdam city center, has been the property of Bouwinvest Dutch Institutional Office Fund since 2015. The former Beursgebouw (stock exchange) is a historical monument and the complex’s total floor surface area is 76,000 m². WTC Rotterdam is a member of the World Trade Centers Association and houses more than 250 tenants. Apart from providing businesses with state-of-the-art office space, the building is widely recognized for its high quality facilities such as a convention center, the WTC Rotterdam Business Center (flexible working spaces), Business Services, garages, Business Club, shops, hospitality facilities and an Art Gallery. A hotel and a gym will soon be added to its facilities. WTC Rotterdam collaborates with various partners in the area of international business and the international World Trade Center network.